I came across the idea of making my own anthology here. So far I have three poems although I plan on including some of my favorite book excerpts and a few of my own drawings as well. Once I have a fair collection going, I’m going to type up a table of contents to attach to the first page, which I left blank. Here’s what I have so far! I sat outside my dorm one afternoon this spring and drew this tree. It actually had leaves on it, but drawing leaves seemed too daunting a task, so I left it naked. I used watercolors here and traced the flame shapes from the internet onto patterned paper for some embellishment. I love this poem but can’t find out anything about the person who wrote it! When I searched his name in Google, this poem is the only thing that comes up, and no one else seems to know who he is either. The lacy tree/leaves were cut out of a piece of scrap material. I used a hot glue gun to attach them. Creativity! Use whatever you have around the house to decorate/illustrate the pages. Leave the first page or two blank so you can attach a table of contents later. Number the pages (I numbered mine on the back, left hand corner of each page). If you’re using paints or anything that might bleed through the page, protect the next page by putting scrap paper between the two. Be sure to write down the name and author of everything you include. If you do illustrations in pencil or charcoal, be sure to use a fixative so they won’t smudge as you flip the pages. If you’re cheap like me, a few coats of hairspray does the job just as well. I tweaked the panda pattern, which I got from the Lion Brand yarn website. 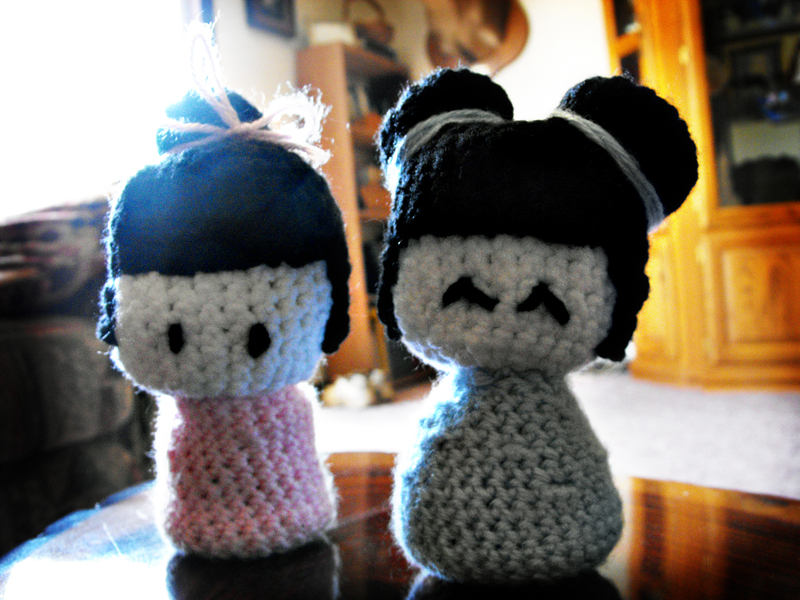 I freehanded the two kokeshi dolls after being inspired by this and this on etsy. Most of the crocheted kokeshi dolls I’ve seen on the internet have obi belts or something on. I might add some later, but I kind of like them plain. Welcome to my blog! This is my first stab at blogging. I plan on posting about crafty, DIY type of things along with music, some of my art, and a bit of fashion, although some of it will be sure to overlap. Check out the “About” page to learn more about me.